Allied Arts is host to a new exhibit by Milledgeville artist Stephanie Scott. Titled “A Retrospective: Etchings and Paintings,” many of Scott’s works are influenced by Georgia’s Lake Country. 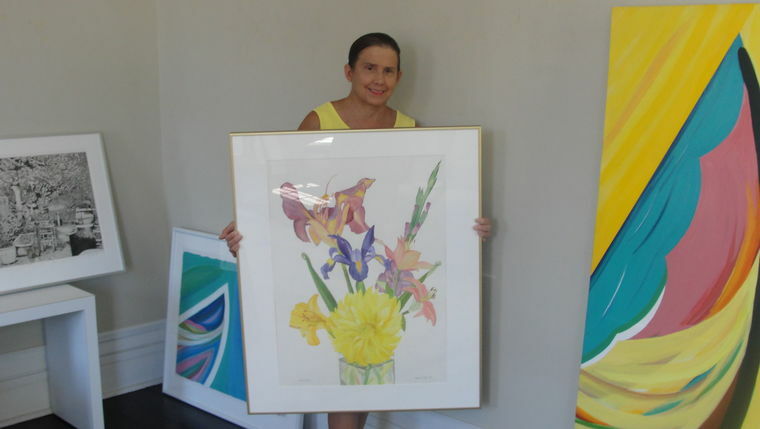 Artist Stephanie Scott holds a watercolor entitled ‘Summer Flowers.’ It is one of the many pieces of art that will be on display and available for purchase during an exhibition of her work. Originally from Milledgeville, Scott resides in the San Francisco Bay area. Her career in art stretches more than 50 years. Originally a botany/biology major, Scott soon switched to art. After graduating with a B.F.A. in art from the University of Georgia, Scott moved to San Francisco and continued her education at the San Francisco Art Institute, earning an M.F.A. For the next seven years, she focused on creating etchings and primarily creates black and white line etchings of plants and landscapes. “One of the things that I find interesting is that she still uses the same tools and materials and processes that were used in the 17th century,” said Allied Arts director Randy Cannon. The original intaglio prints have many steps in their creation, and Scott will discuss these steps during an opening reception. Intaglio, Italian for “beneath the surface,” is the direct opposite of a relief print. A plate is covered in wax or an acid-resistant material and then an image is cut into the material with an etching needle or similar tool. Scott uses a pre-made etching ground and melts splotches onto the plate, which she then rolls smooth. If she wants to make a change to the drawing in the ground, she simply paints out what she doesn’t want with liquid roofing tar. After Scott finishes her drawing on the wax, she will paint over any scratches. The plate is then dipped into an acid bath where the acid eats away at parts of the plate that are not covered in wax. This creates grooves in the plate into which ink is applied. Damp paper is applied to the image, and the plate is then put through a high-pressure roller. Due to the pressure from the roller and dampness of the paper, the paper is pushed into the grooves of the plate. When the paper is removed, an image is left on the paper. If the artist desires, he or she can then hand-color the image with watercolor to add color to the original drawing. 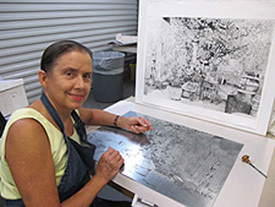 Scott says she usually makes 185 prints per etching, and because of her skill and experience in making the prints, a person cannot tell the first print from the last. Scott has also done a series of colorful watercolors of imaginary places. In 1992, she began a notecard business publishing watercolor studies of flowers she has grown. Scott has worked from both nature and in abstraction and still has an interest in both. “To me, abstract work and work from nature are not totally separate things,” Scott said. Scott also has acrylic paintings and a number of watercolors that were inspired from her hobby in swimming. Those pieces are often abstract. Her watercolors are painted on a French-made paper that Scott says is as thick as cardboard. Though she says she’s primarily a black-and-white artist, she uses vibrant colors in many of her paintings. The exhibition of her work in Milledgeville came about due to her visits with family here. During her visits, she would also stop by Allied Arts. “As an artist, she would come by the gallery and visit,” Cannon said. She and Cannon began talking about her works, and interest in a Milledgeville exhibition was sparked. The after much planning, an exhibition was finally scheduled for the Marlor House. The exhibition will feature many etchings and watercolors. All art will be available for purchase, ranging in price from $30 to $700. Her work will be available for purchase both from the Marlor House during the exhibition as well as Scott’s website, stephaniescottartist.com. The Milledgeville Civic Women’s Club will hold a reception honoring the artist from 1 to 3 p.m. Sunday, Sept. 7, at the John Marlor Arts Center, 201 N. Wayne St. Scott will be in attendance and make a presentation on her work, including detailing how she creates etchings. The public is invited to attend. “A Retrospective: Etchings and Paintings” will be on display from Sept. 7 through Oct. 31. Gallery hours are 9 a.m. to 4:30 p.m. Monday through Friday or by appointment. Visiting the gallery is free of charge. For more information, call Allied Arts director Randy Cannon at 478-452-3950.